“IT COULD have been worse” was the common refrain as American banks began reporting their second-quarter earnings. Indeed, the striking characteristic of the returns was their consistency. Big and small, local and national, lenders across the country have been benefiting from some common tailwinds. Legal settlements are becoming sparser; the economy is expanding, albeit feebly, and the housing market is recovering; auditors are pushing banks to keep releasing loan-loss reserves; and actual losses are trivial. But avoiding disaster is not really cause for celebration. Consumers continue to shed debt; companies carry ever more cash. Banks’ pre-provision revenue growth is muted (see chart 1), and there has been no recovery in loan growth of the sort seen after previous recessions (see chart 2). This is so unusual that it may be unprecedented, says Michael Mayo, an analyst at CSLA, a securities firm, and it hardly suggests a good prognosis for the banking system. He predicts that the current decade will show the worst revenue growth for banks since the 1930s. Pricing and margins will inevitably tighten as a result. 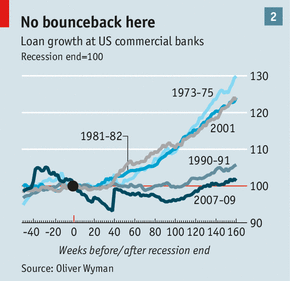 In as much as borrowing activity has shifted from banks’ balance-sheets to the capital markets, some have benefited. The investment-banking arm of perpetually troubled Citigroup did well in the second quarter, as did the investment-banking arm of infrequently troubled Goldman Sachs. Underwriting and advisory revenues rose at both firms. Goldman reaped large gains from its own investments. But Goldman’s return on equity was still barely in double digits. Its headcount is shrinking, not expanding. That is typically the single best indicator of an investment firm’s perspective on its prospects. Citi’s return on equity was well below Goldman’s, at 6.5%. Investors will not tolerate that sort of performance for ever. A major source of Citi’s revenue is in emerging markets, where conditions are deteriorating. The likelihood that the overall banking environment will improve in the near future is low. Recent rises in interest rates, prompted by expectations that the Federal Reserve will start slowing the pace of asset purchases, will take a toll on mortgage refinancing, a source of revenue that has produced great gobs of money for banks in recent years. It is probably no coincidence that share prices for most financial institutions have flattened in recent weeks. 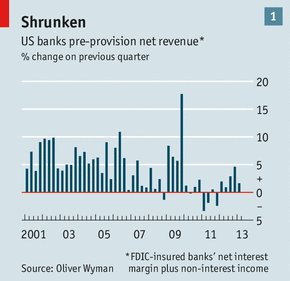 Regulators and politicians are still trying to suppress banks’ risk appetite, not whet it. American financial institutions are already expecting to hold more risk-weighted capital in order to conform with the international Basel 3 standards. Worried by the potential for banks to game the calculations that underpin these same risk weightings, regulators this month proposed a higher “leverage ratio”, a blunter measure of capital that reflects the overall size of a bank’s balance-sheet as well as its riskiness. 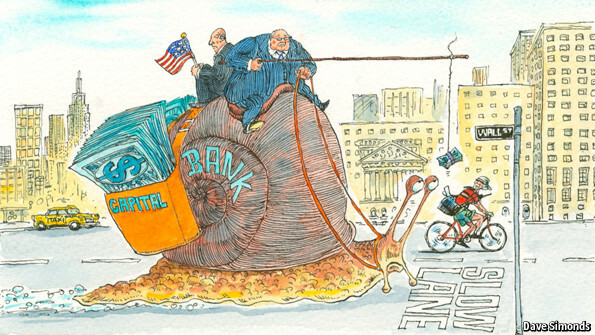 The proposal calls for a 5% leverage ratio at the holding-company level, and 6% at the level of the bank, for the eight largest banks: Bank of America, BNY Mellon, Citigroup, Goldman Sachs, JPMorgan Chase, Morgan Stanley, State Street and Wells Fargo. The new numbers will require institutions to fund themselves with more equity, further diluting returns (at least in the short term). Although the notion of a strict capital ratio has its detractors, it has a good chance of being instituted, says Michael Poulos of Oliver Wyman, a consultancy, if only because it is simple. But by increasing the cost of funding for the big institutions, he warns, the rule may push them away from safer, low-priced products and towards riskier, higher-margin ones. Bankers have not reacted vocally to the leverage-ratio proposal. That may be because they feared even harsher limits, or because they are keeping their powder dry for other fights. Lawmakers continue to circle the industry. In April two senators, Sherrod Brown and David Vitter, introduced a bill that would require the largest banks to increase their equity capital to 15% of assets. It was loudly applauded, and subsequently quietly ignored. On July 11th four senators proposed bringing back a version of the Glass-Steagall Banking Act of 1933 that separated commercial banking from investment banking. This idea has also garnered lots of praise and is also likely to be ignored, if only because of the practical difficulties involved. Even if these legislative proposals go nowhere, the regulatory environment is poised to become tougher with the Senate’s approval on July 16th of Tom Perez as secretary of labour and Richard Cordray as head of the Consumer Financial Protection Bureau (CFPB). In his prior position at the Department of Justice Mr Perez was an influential advocate of the principle of “disparate impact”—the idea that lending policies can be discriminatory because of their outcomes, even if there is no intent to discriminate. His approval is a congressional endorsement of uneconomic lending. Mr Cordray’s appointment unlocks broad powers for the newly established CFPB, including the ability to investigate and regulate the price and scope of financial products under a new and undefined “abusive” standard. Senate Republicans had vowed to refrain from approving Mr Cordray until changes were made to the CFPB’s underlying structure, so that less power was concentrated in a single director and its budget was made subject to congressional approval. Whatever concerns they had were abruptly waived. Perhaps, like many of America’s banks, they concluded that however bad things are, they could always be worse. If you think China's Communist Party fully understands the mess it has created by ramping credit to 200pc of GDP and running the greatest investment bubble know to man, read its shockingly complacent response to warnings from the International Monetary Fund. The IMF's Article IV report on China states - as clearly as the IMF dares - that excess credit has been pushed to the outer limits of sanity, and that there is a growing risk of an "adverse feedback loop" as the financial system and the economy take each other down in a mutually reinforcing spiral. As you can see from the first chart, total credit has jumped from 129pc to 195pc of GDP since 2008, and has completely departed from its historic trend. The great mistake, plainly, was to keep the foot on the floor in 2010 and 2011, long after the Lehman crisis had subsided. The deeper thrust of the IMF report is that the growth model of the past 30 years is exhausted. The low-hanging fruit has been picked. If the Communist Party fails to take radical action, it will soon be caught in the middle income trap. Charlene Chu at Fitch has a slightly higher credit ratio because she includes a broader range of shadow banking, but the IMF paints much the same picture. Loans have jumped from $9 trillion to $23 trillion since 2008, a faster pace of debt build-up than in any major episode of the past century. Total credit is higher in many rich countries but that means little. China's ratio is double or triple the level in states with a similar per capita income. The Fund said wealth products (WMP) and trusts - a disguised second balance sheet of banks, worth $2 trillion - "could over time evolve into a systemic threat to financial stability". A sudden loss of confidence could "trigger a run" and set off "a severe credit crunch". "As of now, the authorities still have sufficient tools and fiscal space to address potential shocks. However, failure to change course and accelerate reform would increase the risk of an accident or shock that could trigger an adverse feedback loop," it said. China has been warned. Beijing's replied dismissively that "vulnerabilities were well under control". It said the fast growth of wealth products and trusts were a healthy sign of "market-based intermediation". Any risks were "manageable". Bad loans in the banking system "remained low and Chinese banks had some of the highest capital and provisioning ratios in the world". Do you laugh or cry? It may be that the barrage of criticism lately from the IMF, Fitch and others has nettled Beijing more than it lets on, hence the violent "stress test" of the banking system in late June. If it was indeed a stress test, one wonders what they learnt as the interbank market seized up in a Lehmanesque moment and intra-day Shibor rates exploded to 30pc. Xia Bin from China's Development Research Center (DRC), home of reformers, says it is time to end happy talk and brace for condign punishment. "We need to find ways to let the bubble burst and write off the losses we already have as soon as possible to avoid an even bigger crisis. It means hard days, it means the bankruptcy of some companies and financial institutions, above all it means reform," he said. Mr Xia said the debate over China's growth rate - allegedly 7.5pc - is surreal since the country is already in the grip of an unprecedented financial crisis. Professor Michael Pettis from Beijing University expects growth to fall to 3pc or 4pc over the 10-year term of President Xi Jinping, which would come as a shock to many. He argues that this may be no bad thing provided the government bites the bullet on reform, and provided the Chinese people are at last given a bigger share of the pie. Headline growth would collapse, but household income would not. This is what occurred in Japan after the Nikkei bubble burst. The Chinese people would hardly feel the difference. The social upheaval everybody fears might never happen. Mao statues might not topple so soon after all. Unfortunately, the reform drive has yet to advance much beyond hot air. "Progress with rebalancing has been limited and is becoming increasingly urgent. A decisive shift toward a more consumer-based economy has yet to occur," said the IMF. China is still diverting 48pc of GDP into investment, the highest in the world and far higher than the figure in Japan or Korea during their catch-up spurts. Consumption is still stuck at around 35pc of GDP, which matters for the rest of us. It means that the country is still reliant on export-led growth, flooding Western markets with excess goods by means of a suppressed currency and subsidised state credit. The IMF expects China's current account surplus to rebound from 2.5pc of GDP to 4pc by 2018. That surplus will be $600bn or so, enough to perpetuate the crisis of over-capacity that lies behind our global malaise, and to be a horrible prospect for southern European societies that cling to the D-Mark. China's savings rate has continued to ratchet up, not because the Chinese have uniquely Puritanical habits, but because workers never receive the money in the first place. The lion's share goes to the great state entities, the patronage machines of the Party, and these behemoths are defending their turf with tooth and claw. They also have powerful allies in the Standing Committee. Chart 3 shows that China will fail to replicate the break-out spurt achieved by Japan and Korea if it clings to the status quo. Per capita income will languish at around 25pc of America GDP per capita through the decade. This will happen just as China's aging crisis and demographic crunch hit in earnest. The workforce is already shrinking. It shed 3m people last year. The IMF says the 160m "reserve army" of cheap labour in the country will dry up by the end of the decade - the long-feared Lewis Point. This will turn into a drastic shortage of labour by 2030. Given that the US will keep growing towards 400m people as China's population shrinks, the basic maths imply that America will continue to be the world's dominant economic (and strategic) power for the next century. All those extrapolation charts of a Chinese-led planet that enthralled us all in the BRICS hysteria of 2008 will look very silly indeed, unless China heeds the IMF's advice. I have no doubt that premier Li Keqiang genuinely wishes to move to "market mechanisms" and break the monopoly of the party cadres over the industrial machine. He was the sponsor of a report last year arguing that China would have to abandon its top-down model and embrace the free market and - more controversially - free thought as well. "Innovation at the technology frontier is quite different in nature from catching up technologically. It is not something that can be achieved through government planning," it said. Whether the shrewd equivocating Xi Jinping will ever let him have his way is another matter. Mr Xi seems to think he can keep a vibrant market economy on a short leash, preserving the iron fist of party control. History suggests that the Politburo cannot have it both ways. NEW HAVEN – You might think that we have been living in a post-bubble world since the collapse in 2006 of the biggest-ever worldwide real-estate bubble and the end of a major worldwide stock-market bubble the following year. But talk of bubbles keeps reappearing – new or continuing housing bubbles in many countries, a new global stock-market bubble, a long-term bond-market bubble in the United States and other countries, an oil-price bubble, a gold bubble, and so on. Nevertheless, I was not expecting a bubble story when I visited Colombia last month. But, once again, people there told me about an ongoing real-estate bubble, and my driver showed me around the seaside resort town of Cartagena, pointing out, with a tone of amazement, several homes that had recently sold for millions of dollars. The Banco de la República, Colombia’s central bank, maintains a home price index for three main cities – Bogotá, Medellín, and Cali. The index has risen 69% in real (inflation-adjusted) terms since 2004, with most of the increase coming after 2007. That rate of price growth recalls the US experience, with the S&P/Case-Shiller Ten-City Home Price Index for the US rising 131% in real terms from its bottom in 1997 to its peak in 2006. This raises the question: just what is a speculative bubble? The Oxford English Dictionary defines a bubble as “anything fragile, unsubstantial, empty, or worthless; a deceptive show. From 17th c. onwards often applied to delusive commercial or financial schemes.” The problem is that words like “show” and “scheme” suggest a deliberate creation, rather than a widespread social phenomenon that is not directed by any impresario. Maybe the word bubble is used too carelessly. That seems to be the core of the meaning of the word as it is most consistently used. Implicit in this definition is a suggestion about why it is so difficult for “smart money” to profit by betting against bubbles: the psychological contagion promotes a mindset that justifies the price increases, so that participation in the bubble might be called almost rational. But it is not rational. The story in every country is different, reflecting its own news, which does not always jibe with news in other countries. For example, the current story in Colombia appears to be that the country’s government, now under the well-regarded management of President Juan Manuel Santos, has brought down inflation and interest rates to developed-country levels, while all but eliminating the threat posed by the FARC rebels, thereby injecting new vitality into the Colombian economy. That is a good enough story to drive a housing bubble. Because bubbles are essentially social-psychological phenomena, they are, by their very nature, difficult to control. Regulatory action since the financial crisis might diminish bubbles in the future. But public fear of bubbles may also enhance psychological contagion, fueling even more self-fulfilling prophecies. One problem with the word bubble is that it creates a mental picture of an expanding soap bubble, which is destined to pop suddenly and irrevocably. But speculative bubbles are not so easily ended; indeed, they may deflate somewhat, as the story changes, and then reflate. It would seem more accurate to refer to these episodes as speculative epidemics. We know from influenza that a new epidemic can suddenly appear just as an older one is fading, if a new form of the virus appears, or if some environmental factor increases the contagion rate. Similarly, a new speculative bubble can appear anywhere if a new story about the economy appears, and if it has enough narrative strength to spark a new contagion of investor thinking. This is what happened in the bull market of the 1920’s in the US, with the peak in 1929. We have distorted that history by thinking of bubbles as a period of dramatic price growth, followed by a sudden turning point and a major and definitive crash. In fact, a major boom in real stock prices in the US after “Black Tuesday” brought them halfway back to 1929 levels by 1930. This was followed by a second crash, another boom from 1932 to 1937, and a third crash. Speculative bubbles do not end like a short story, novel, or play. There is no final denouement that brings all the strands of a narrative into an impressive final conclusion. In the real world, we never know when the story is over. Robert J. Shiller is Professor of Economics at Yale University and the co-creator of the Case-Shiller Index of US house prices. He is the author of Irrational Exuberance, the second edition of which predicted the coming collapse of the real-estate bubble, and, most recently, Finance and the Good Society. As chair of the influential Senate budget committee, Patty Murray spends much of her time considering the effects of spending cuts. But even she was taken aback by what she found when she flew home to the Pacific Northwest over the July 4 holiday. Sequestration – the automatic spending cuts that began in March and are worth $1.2tn over the next decade – is dealing a tough blow to many of the communities that she represents in Washington state. “It’s those families with tears in their eyes because they don’t know how they’re going to pay their bills,” Ms Murray tells the Financial Times. The cuts are crippling people who had only just been making ends meet. The veteran Democrat described small pizza joints losing customers, civilian workers on military bases on mandatory unpaid leave, domestic violence shelters that had been shut down and early childhood education programmes that had been axed, leaving parents to wonder how they would make it to work. “They are hitting a part of the population that has really paid the price over the last five years and it is having a huge impact,” says Ms Murray. But just as austerity is starting to hurt badly, the US fiscal position is the brightest it has been since President Barack Obama arrived at the White House in the midst of the recession and financial crisis. In 2009, the budget deficit hit $1.4tn, or 10.1 per cent of GDP. In this fiscal year, which ends in September, America’s deficit will be $642bn, or 4 per cent of the economy, the Congressional Budget Office said in May. By 2016, Mr Obama’s final full year in office, it will be $432bn, or 2.3 per cent of GDP – though it is projected to rise in the following years. The improvement in US public finances represents a surprising turnround after fears that the US would soon face a debt crisis, with investors shunning Treasury bonds and with sharply higher interest rates. Instead, the steady economic recovery – in part bolstered by a shale gas boom and a rebound in the housing market – has helped cut tens of billions from US deficits by delivering more revenue to the government. Higher tax rates on the wealthy enacted in January and sweeping spending cuts have also contributed. Government health spending is also rising more slowly than previously expected. triple A credit status in 2011, last month upgraded its outlook for the country from “negative” to “stable”, meaning it is less likely to suffer further downgrades. Yet few are celebrating in Washington, since there is a broad consensus that the country’s fiscal path, while in better shape than it has been, is far from perfect. Many complain that the contraction in the short term – including sequestration – is too deep, holding back the economic recovery at a time when the unemployment rate is still 7.6 per cent and growth could be accelerating faster. Meanwhile, a gridlocked political system has been unable to put in place reforms that would adequately cut the long-term cost of big social safety net programmes such as Medicare and Social Security, which is set to rise sharply over the coming decades as the population ages and baby boomers retire. The only cuts to the budget so far have been to “discretionary spending”, a vast category that includes Pentagon procurement contracts, grants for medical research from the National Institutes of Health and funding for National Parks. This has resulted in employees being placed on mandatory unpaid leave at agencies ranging from the Office of the US Trade Representative to the Internal Revenue Service. Christine Lagarde, managing director of the International Monetary Fund, was unambiguous in her critique of America’s fiscal stance last month. “Slow the fiscal adjustment this year – which would help sustain growth and job creation – but hurry up with putting in place a medium-term road map to restore long-run fiscal sustainability,” she said. But neither less fiscal tightening in the short term nor more fiscal tightening in the long term appear to be on the cards, raising the prospect of a protracted period of shortcomings in budget policy. Despite the pain of sequestration, unravelling the cuts has proved harder than expected. Republicans have grown comfortable with reductions to the defence budget, which they traditionally tried to protect at all costs but are now willing to allow to avoid raising taxes. Democrats have no desire to swap cuts to big programmes such as Medicare and Social Security for the shorter-term reductions to government agencies unless Republicans accept higher taxes on the wealthy, creating an impasse. Nor is more short-term fiscal stimulus an option to offset the impact of sequestration as Republicans are unwilling to embrace the infrastructure investments or early-childhood education programmes proposed in Mr Obama’s budget this year. At the same time, the pressure to tackle long-term problems such as the solvency of Medicare, which is due to face financial problems in 2026, and Social Security, which will run into difficulty in 2033, has eased. While it was always a hard sell, it is now even less politically palatable for many members of Congress – even though Washington’s business groups and deficit hawks have been clamouring for years to get this done. A shrinking déficit makes it more difficult to sound the alarm. “There’s no question that the discussion has changed a bit,” says Steve Rattner, a former senior Obama administration official who chairs Willett Advisors, the philanthropic and investment holdings of Michael Bloomberg, the New York mayor. “If you imagine this like a war with two armies, I would say that the dark side has advanced a little bit. My hope is that at some point the good guys will push them back, but I don’t know that,” adds Mr Rattner, who helped raise money from chief executives for “Fix the Debt”, a group calling for a “grand bargain” to tackle the country’s long-term fiscal challenges. Key to getting such a deal in place are two ingredients that have grown more elusive over the past few months. Republicans, who accepted an increase in tax for the wealthy after Mr Obama’s re-election, are no longer willing to embrace any new tax increases, even if they come from curbing tax breaks in a sweeping revamp of the tax code. And without that key component, Democrats say they would never agree to any big efforts to rein in big entitlement spending programmes. Those of Mr Obama’s party who might have considered cuts to Medicare and Social Security in a big package may now be even less inclined to amid the generally improving fiscal outlook, since there is less urgency for changes. Alan Simpson, the folksy octogenarian former Republican senator from Wyoming who co-chaired Mr Obama’s fiscal commission and helped found “Fix the Debt”, is frustrated that lawmakers appear to have been “lulled to sleep”. “A little progress, more good numbers, I think that’s great, that’s a cheerful thing. But go down 20 and 30 years out and if you can find anybody who will tell me that roses will be in the streets, the drinks are on me,” says Mr Simpson. Jevin Hodge, a 19-year old student at George Washington University from Tempe, Arizona, will be returning to Washington next week to help “Fix the Debt” rally lawmakers to a deal, laments that the “fire has started to die down” on the issue. “Ultimately things are progressing, everything is moving in the right direction but the thing is, what we’re left with is the politicians getting comfortable – we need to keep the foot down and keep the pressure on our elected officials,” he says. Yet some, particularly Democrats and liberals, argue that it is precisely the fixation on long-term deficits and the pursuit of a grand fiscal bargain that has led to the kind of imperfect budget policies, including sequestration, that the US is now grappling with. They are urging lawmakers to focus on the short term and find a small package of measures that would help switch off sequestration, at least for a few years, as the best way to help the recovery. The next budget negotiations, in the autumn, will be pivotal. Not only does Congress need to strike a funding bill to prevent a partial US government shutdown on October 1, but either in October or November it will also have to raise America’s borrowing limit. Brinkmanship between Republicans and Democrats over the debt ceiling in 2011 brought the country within hours of its first ever default, a prospect few are eager to see repeated. There is no clear path to a deal but most are betting that there could be some kind of small package of measures to delay tougher decisions until after the midterm congressional elections next year. Mr Rattner still hopes for a bigger deficit reduction. “There’s going to be another food fight on Capitol Hill and so we’re hopeful that the food gets thrown in the right direction,” he says. Indeed, the bluster has already begun. Last week, Marco Rubio, the Florida Republican senator, delivered a tough speech, saying a “line in the sand” needed to be drawn on the debt ceiling, making clear his party would keep demanding deep spending cuts and reforms to programmes such as Medicare with no tax increases. “The only thing worse than the sequester is to raise taxes to prevent the sequester because that will hurt job creation in America – the only thing worse than the sequester is to not have any spending reductions at all,” he said. Copyright The Financial Times Limited 2013.